Feeling tired? If you ever drained and often have trouble in your daily life, anaemia may be to blame. Anaemia is the commonest medical disorder in pregnancy; nutritional anaemia is the commonest type of anaemia. During pregnancy, there is a disproportionate increase in plasma volume, RBS volume and haemoglobin mass. There is all time a physiological iron deficiency state during pregnancy. Let’s see the normal haemoglobin range, types, causes and symptoms of anaemia during pregnancy. 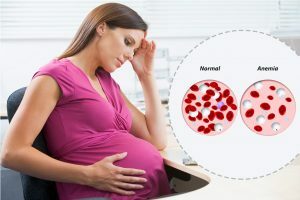 According to WHO the normal range of blood haemoglobin should be (12-16 g/dl), the haemoglobin level during pregnancy can naturally lower to 10.5 g/dl, representing the normal anaemia during pregnancy. Iron Deficiency anaemia: The main cause of this is blood loss, you can treat this type of anaemia with iron supplements. Nutritional deficiency anaemia: Lack of protein, iron, folic acid and vitamin B12 can cause this type of anaemia. You are suggested to eat meat, fish, eggs, green leafy vegetables, etc. it can also treat with iron supplements orally, advice on proper feeding of pregnant mothers since healthy mothers give a good store of iron to their unborn babies. Hypoplasia: This is generally caused due to chronic infections, leukaemia various deficiencies like ascorbic acid, protein, etc. This can be prevented by treating infections as soon as possible. 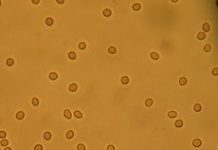 Aplasia: Poisons, drugs, depressive bone marrow are the common causes of aplasia. Pregnant women and children should avoid situations that could expose them to toxic conditions, such as industrial toxins and radiations. There should be controlled use of drugs, especially sulphonamides, chloramphenicol, phenylbutazone and cytotoxic agents. Sickle cell Anaemia: this is caused due to abnormal red blood cells; sickle cell patients should avoid situations that could precipitate a crisis, such as extremes of cold, dehydration and exhaustion. Folic acid should be given to sickle cell patients daily. Abnormal destruction of red cell (hemolysis): Infections such as malaria, burns, and mismatched blood transfusions can lead to this condition. Extensive burns should be managed properly. Consumption of low fruits and vegetables and low vitamin B 12 intake. Very low or poor bio-availability, of dietary iron from phytate tannates, fibre and polyphenols rich diets. Poor pre-pregnancy iron balance due to untreated systemic diseases, closely spaced pregnancies and menstrual disorders. Women who smoke or those with two pregnancies with less time span between them or with twins are more venerable to being anaemic. Shortness of breath or dull appearance. 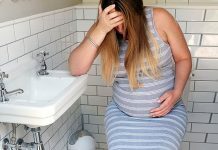 Women who are heavy blood flow during periods before pregnancy or those who suffer from morning sickness with regular vomiting are likely to get anaemic soon. Anaemia is harmful since it creates a lot of complications during delivery. Fatigue is one of the first sign of anaemia in many women, have a sluggish Most women do not even realise that they have anaemia. Paleness, your palms, face and your nails may look pale. Shortness of breath mainly happens when you climb your stairs, exercise or lifting any hard things. You can hear a whooshing sound from your ears when you lie down, the heart start racing and you will have a palpitation. Many women with iron deficiency anaemia, many people have a habit of chewing ice.